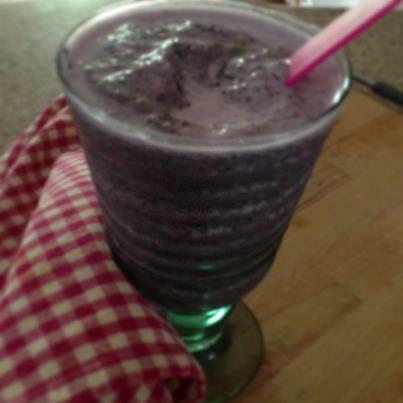 Smoothies | The Gluten Free Clan and our adventures…. I have just started drinking smoothies on a daily basis. One because I have noticed without a doubt my diet is in serious trouble and I needed to address it, yes I know thank you captain obvious! I’m not completely there but at least I am taking a step in the right direction. Two it is such a filling and easy way to get nutrients that I have been lacking. This one above has frozen blueberries, mango, fresh Kale,spinach and low fat milk. Those of us that have to eat gluten free you know that it is difficult to get proper nutrient absorption. Drinking smoothies is such an easy way to do it. And all those fruits and vegetables that we buy during the week and have great intentions to consume..well if you are anything like me half the fresh veggies got tossed and some of the fruit. But I find making smoothies with them is so easy and I’m not pitching them at the end of the week and I am noticing more energy yay!!! Saving money and beginning to get healthier sounds great to me!